You can find marriage records for free in numerous places. This source is useful to genealogists, as it establishes a date and a place of a wedding and lists the maiden name of the bride. There are numerous lists online for a genealogist to use. Almost all online marriage records are published by locality. Large counties may have marriage licenses online. For example, the Bexar County Clerk in Texas has an online searchable database of licenses, as well as other records, back to 1837. Searching is free; it only requires registering. The County Clerk of Cook County, Illinois also maintains a searchable database of licenses over 50 years old. It also requires registration, but it is free. Looking for county clerk websites specific to the counties you are interested in is a great starting point for locating marriage documentation. Marriage records are so important to family researchers that almost every genealogical website will have these listed in some format. Some will have searchable databases; others will have lists of transcribed marriage information from county clerk's offices, family bibles or church records.The USGenWeb is a volunteer organization that hosts a website for every county and state in the United States. While the amount of information on each website varies, almost all of the USGenWeb sites have a marriage listing. This is a popular place to find family Bible transcriptions. You may research on any of the USGenWeb sites for free. Another popular website for finding marriage records for free is the Family Search Record Search. This project of the Church of Jesus Christ of Latter Day Saints (LDS) contains marriage databases from all over the world. The United States collection includes marriages from Arkansas, Indiana and West Virginia. Genealogists are always helping each other with research. Random Acts of Genealogical Kindness, or RAOGK, is a volunteer group that helps researchers find records in the volunteer's hometown. By joining ROAGK for free, you can ask a researcher to look up records in a location where you need help. You will be asked to sign up to help someone who needs information in your area. Genealogy forums are another place where researchers help each other. You can post a query on a forum regarding a marriage record and if a forum member is able to help you, the member will post a reply with the information. Two free genealogy forums, also called message boards, are Rootsweb and GenForum. If you are able to visit the county where the couple married, be sure to visit the county clerk's office in the county seat. 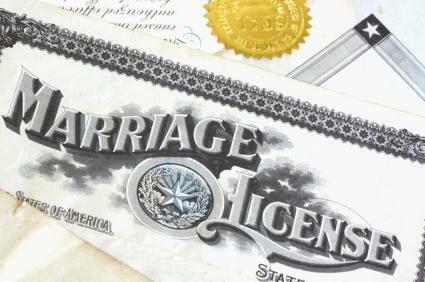 Marriage records are public information, so you can search the record books for the license. You will be charged to make a copy of the license, but you can make take notes for free. Local libraries usually have a genealogy section of books and reference materials. They also may have subscriptions to the genealogy services, such as Ancestry.com, that you may use for free. State archives will usually have either microfilm or book listings of marriages for that state. Some state archives will have a genealogy section that will have marriages for other states as well. These archives are located in the state capitol. Churches may also maintain historical marriage records. If you know a denomination for a couple, or the name of the church, check with the church. They may be able to assist you in locating a marriage record. A marriage is an important event in a family. It is also important in family tree research, as it joins together two family branches. Marriage records are the documentation for this family occasion and therefore, a vital source for genealogists.